Thanks for response, but now I have a bigger problem, there is no video, only black screen (Audio works). HDMI works. Not sure if my Tv module, Pibus or something else died. Not a lucky day . Last edited by BMW 740iL NL; 03-09-2016 at 10:20 AM. I made a video to demonstrate how it behaves. I forgot to show that sound is present when I play around with a knob in Pibus option. You also will notice that when I switch between radio and pibus you can see "CD-04" for very short time. Last time I used pibus was half year ago and then it worked just fine. I tried different SD cards, nothing helps. I can try to replace TV module but I doubt that it is faulty, because TV works just fine. If problem with pibus hardware, maybe I can use HDMI to RCA cable to bypass Pibus? Somehow I put the Pi into the car this evening and it works! Am running OSMC so need to get the audio working. Worst case I switch to OpenElec. Thanks a lot Pete! cannot view the video. YT says it is private. Did you try to select television first in the BMW menu? Sorry about that, now the video should work. Once I start the car it automatically goes to Pibus. But I tried playing around, you should see that in Video. Did not made any difference. I will try different TV module on few days. If that does not help I will try HDMI to RCA cable. So far I'm out of any other ideas. Thanks for help though. Yeah I read that and double checked TRRS. I checked wires with multimeter for continuity. All seems right. However, I guess to be sure, I could take apart TV module and check continuity from pins to Pibus. Make sure the HDMI is disconnected, because it will cause the RCA/composite to turn off until the next power cycle. Using openelec? Some other operating systems might turn off the composite. I've bought TRRS cables in the past that didn't work for whatever reason so could be that. I'm still no closer to figuring out why I've got alternator whine/ground loop issues with my setup, it seems to be something with the changer input as people are getting similar problems with the Dice units, and the Dension (though not as common as they don't seem be very popular). Everything else seems to be in order, just seems to be the Pibus input that whines - I've plugged a CD changer back in to test and that has zero issues. Pete, have you had anyone else ask you about this issue? In this post Lobocobra killed his noise on the line with a Sinuslive. Anybody else uses this as well? Does the connection to the videomodule cause the ground loop? Could placing a relay between the pibus and the reverse camera trigger in the video module eliminate the ground loop? Last edited by BMW 740iL NL; 03-10-2016 at 03:05 PM. I've got the same whine on my pibus to the point i can't use it. I was going to upgrade to a V4 unit to see if it goes away. The reverse camera is currently unplugged to see if that solved the problem, but nope. did you try the Sinuslive? I've heard of the alternator/engine noise coming through for some people, but not many. It's usually with some older E38/E39s. I am thinking it might be only MK2/3, but it's difficult to know. On my car, there is nothing, it's really silent no matter what the engine is doing. So it's hard for me to get involved in looking at it. Some guys just installed a ground-loop-isolator in the audio path. Did you try grounding the "other" wires in the CDC cable (the 6-pin plug)? I heard some cars have some extra ground wires in there. Someone also mentioned installing a big capacitor on the +12v input. I dunno what the theory behind that is. Really need to find an easy fix for this. Can someone donate me an E39 M5? 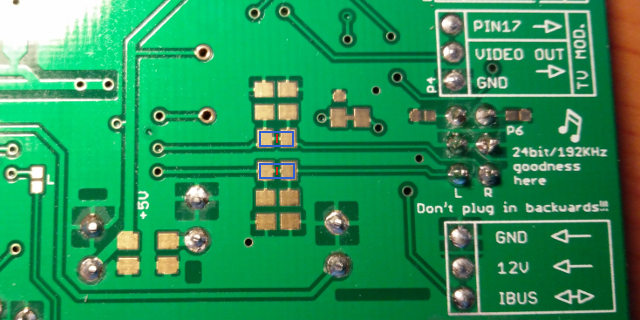 It would involve cutting those 2 traces (red lines) and add 2 caps (say ~10uF). But if I tried it, it would make no difference in my car. Anybody handy with electronics care to try? If it helps, I've got a 2003 E46 with a BM54 amp with an analogue TV tuner and a MK4 nav unit, along with a Pibus V4. As mentioned, it's just on the Pi input, but doesn't seem to happen with the factory CD Changer plugged in - perhaps the changer is grounding to its own chassis and through the rails (I've not opened one up to have a look). What wiring does everyone have on their 6pin? Perhaps we could see if those extra wires are helping and if it's seemingly an issue with those of us with 3 (iirc) wires in that 6 pin plug. 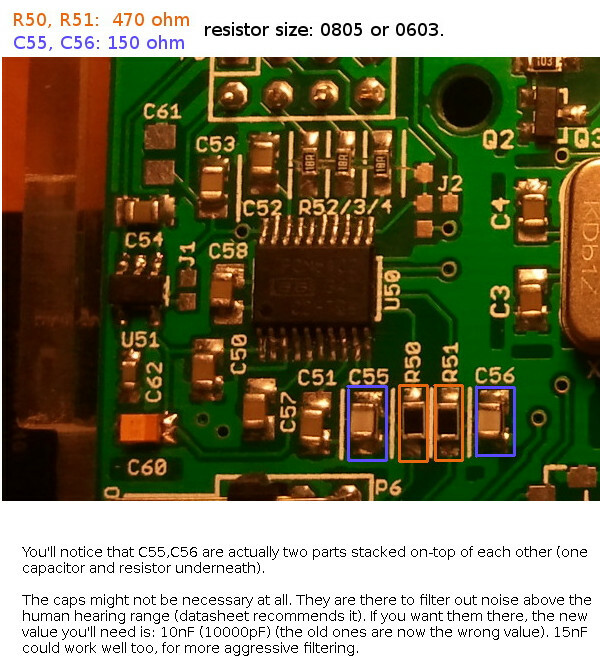 I think it was me that suggested the cap on the 12v input - it was a passing comment one of the distributors of the Dice had mentioned as the guys using those devices seem to have random ground loops too. I tried it quickly by connecting the legs of the cap but it didn't work so I left it as is. red and white for L&R, 1 white for 24 bits/192KHz goodness and 2 black wires: 2x ground? Last edited by BMW 740iL NL; 03-11-2016 at 03:23 PM.